This one-piece undergarment for women looks and feels like regular underwear. The garment is washable and re-wearable for over 150 times. It is made of a silky material made of 100 percent Pointelle cotton, while the inside material is a cotton, polyester and nylon blend. 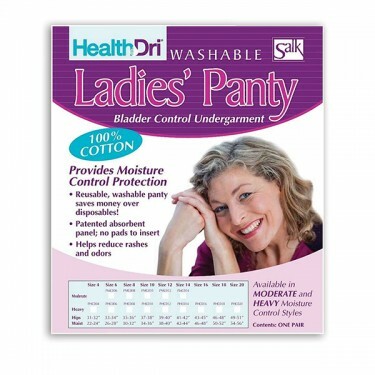 Its patented moisture-control system pulls fluids away from the skin to promote dryness and control odors. Holds up to six ounces of fluid. This is a hygienic item and cannot be returned once the sealed packaging has been opened. When purchasing the correct size please consider the waist/hip measurements and not only the size number. Size 6 fits waist sizes 26-28"
Size 8 fits waist sizes 30-32"
Size 10 fits waist sizes 34-36"
Size 12 fits waist sizes 38-40"
Size 14 fits waist sizes 42-44"
Size 20 fits waist sizes 54-56"
For safety and hygienic reasons this item is not returnable once the sealed package has been opened. my wife has been wearing paper pull-ups at night for some months with increasing irritation; reusables are much more comfortable for her. Cons:seams along inner surface are an irritant to her back, but not insurmountable.